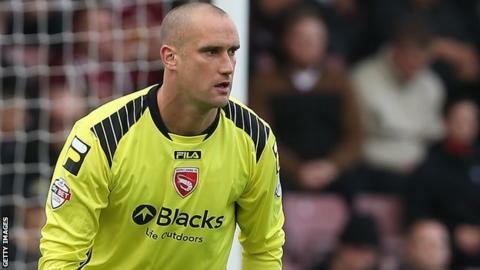 Morecambe goalkeeper Barry Roche has now kept three cleans sheets so far this season. Cheltenham Town extended their unbeaten league run to six games and moved to the top of the table with a goalless draw at fellow high-flyers Morecambe. The Robins had the better of the first half, Barry Roche producing crucial saves to deny both Craig Braham-Barrett and the highly impressive John Marquis. Morecambe grew into the match after the break and both teams pressed for a late goal but failed to break the deadlock. The result leaves the two sides lying in the top two spots in League Two. Steve Elliott should have given Cheltenham the lead with a free header from Joe Hanks' first-half corner but the defender glanced over from less than 10 yards out. Morecambe goalkeeper Roche was then called into action when a Marquis through-ball found Craig Braham-Barrett, whose shot was blocked. Marquis then hit a fine volley from long range that looked to be a certain goal but Roche could not be beaten. Having barely threatened before the break, Morecambe showed greater endeavour in the second half but Jim Bentley's side still rarely looked like scoring. Prior to today's match, loanee Koby Arthur had scored in four of his six appearances for Cheltenham but his late introduction did not stop the match ending goalless. With the joint-leaders at the start of the day, Burton Albion, not playing until Sunday, Mark Yates's side now have a one-point lead over Morecambe at the top of the table. "To stand firm like we did and keep another clean sheet - we wouldn't have done that last year. We'd have caved in. "They're a little bit disappointed that they haven't won it, but a draw's a fair result. "While it was a 0-0, it was still entertainment right until the final whistle." Match ends, Morecambe 0, Cheltenham Town 0. Second Half ends, Morecambe 0, Cheltenham Town 0. Attempt missed. Steve Elliott (Cheltenham Town) header from very close range is close, but misses the top left corner. Corner, Cheltenham Town. Conceded by Ryan Edwards. Corner, Cheltenham Town. Conceded by Shaun Beeley. Attempt saved. Jason Taylor (Cheltenham Town) right footed shot from outside the box is saved in the top centre of the goal. Substitution, Cheltenham Town. Terry Gornell replaces John Marquis. Corner, Morecambe. Conceded by Jason Taylor. Attempt missed. Paul Mullin (Morecambe) right footed shot from outside the box misses to the left. Substitution, Morecambe. Alex Kenyon replaces Andrew Fleming. Substitution, Morecambe. Padraig Amond replaces Jamie Devitt. John Marquis (Cheltenham Town) is shown the yellow card. Joe Widdowson (Morecambe) wins a free kick on the right wing. Corner, Cheltenham Town. Conceded by Andy Parrish. Attempt missed. John Marquis (Cheltenham Town) header from the left side of the box is close, but misses to the left. John Marquis (Cheltenham Town) wins a free kick in the attacking half. Substitution, Cheltenham Town. Koby Arthur replaces Byron Harrison. Foul by Jason Taylor (Cheltenham Town). Attempt saved. Kevin Ellison (Morecambe) right footed shot from outside the box is saved in the centre of the goal. Attempt missed. Jack Redshaw (Morecambe) right footed shot from outside the box is just a bit too high. Attempt missed. Paul Mullin (Morecambe) left footed shot from outside the box is just a bit too high. Attempt missed. John Marquis (Cheltenham Town) header from the left side of the box is just a bit too high. Corner, Cheltenham Town. Conceded by Barry Roche. Attempt saved. Matt Richards (Cheltenham Town) left footed shot from outside the box is saved in the bottom left corner. Attempt missed. Andrew Fleming (Morecambe) right footed shot from outside the box is just a bit too high. Corner, Morecambe. Conceded by Matt Richards. Corner, Morecambe. Conceded by Troy Brown.